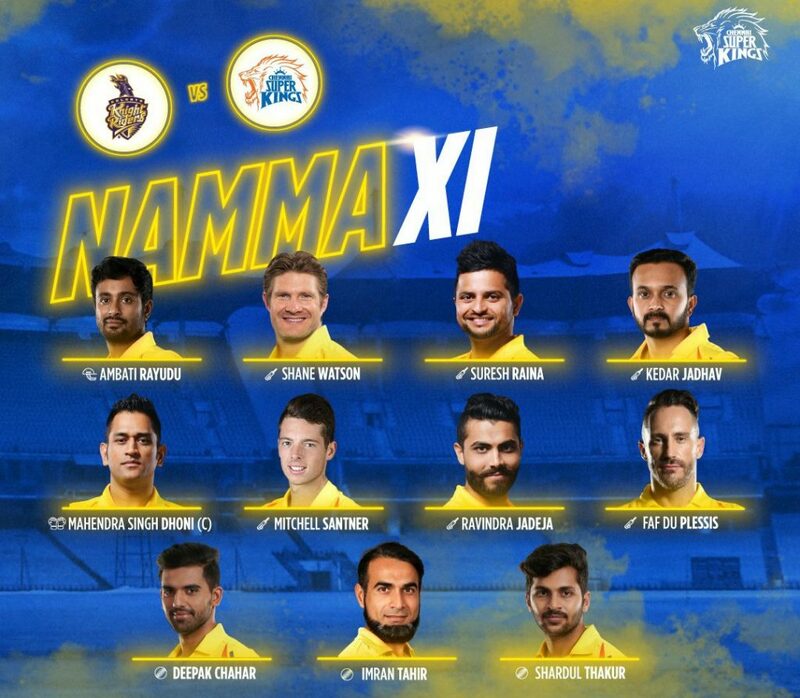 Kolkata included Chris Lynn, Sunil Narine and Harry Gurney in place of Carlos Braithwate, Joe Denly and Lockie Furguson, while Chennai went in with an unchanged line up. After being put into bat by Super Kings, Kolkata Knight Riders lost Narine cheaply to Mitchell Santner for 2. The pair of Chris Lynn and Nitish Rana anchored the innings by adding 41 runs for the second wicket, before Imran Tahir struck twice by claiming wickets of Rana and Robin Uthappa in succession, as the home side were struggling at 80/3. The 29 year old Lynn after scoring a quickfire 82, was caught by Thakur off Imran Tahir. Andre Russell started his innings with a six and boundary, before he was caught brilliantly by substitute Dhruv Shorey. His knock comprised of seven fours and six sixes. Skipper Dinesh Karthik looked good in his brief stay, until he fell to Shardul Thakur for 18 runs. The home side in the last four overs scored only one boundary, as the Knight Riders were restricted to 161/8 in their allotted 20 overs. Imran Tahir was Super Kings best bowler as he bagged 4/27. Chasing a target of 162, the opening pair of Shane Watson and Faf Du Plessis added 29 runs for the opening stand, before the former was dismissed leg before wicket to Gurney. Du Plessis in the sixth over was dismissed by Sunil Narine for a breezy 24. Piyush Chawla struck twice by bagging wickets of Ambati Rayudu and Kedar Jadhav in quick succession, as the visitors were in spot of bother at 81/4. Raina along with skipper Mahendra Singh Dhoni added a valuable 40 runs for the fifth wicket, before the latter was dismissed leg before wicket for 16. With 24 needing off the last 2 overs, Ravi Jadeja smashed Gurney for three consecutive fours to bring Chennai back on track. Jadeja scored 31 off 17 balls, as the Super Kings reached the target with 2 balls to spare. 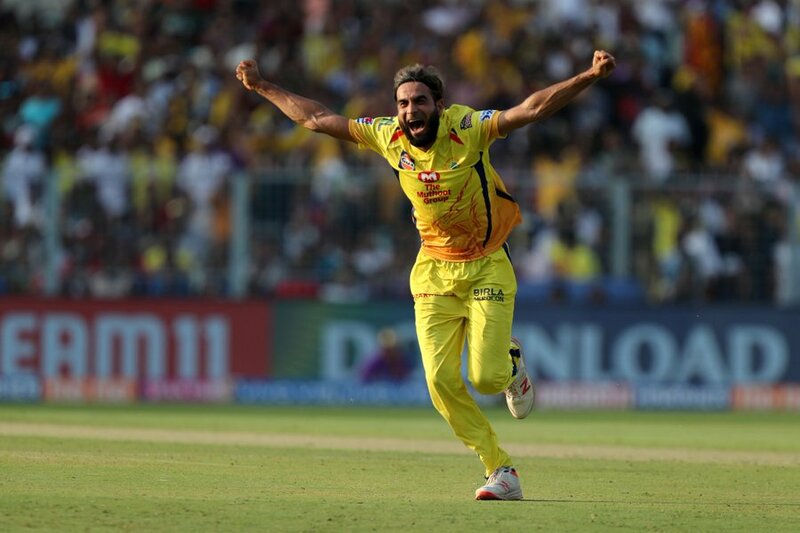 Imran Tahir was declared the Man of the Match for his magnificent spell.